Saturday night's show at Stacy's Place was stranger and slightly more hectic than many past shows at the Hyde Park DIY stronghold. Perhaps due in part to the night's lineup, plenty of unfamiliar faces made their way into the house. In addition to the new blood, at least two attendees were kicked out (or nearly kicked out) due to accusations of sexual assault and related issues. The mosh pit also grew rowdier than usual -- maybe this was because of the night's added tension, or just intense cabin fever. Columbia, Missouri punks Gorbza were lead by a shirtless vocalist who looked and acted as if he were plucked from a Mark Twain novel. 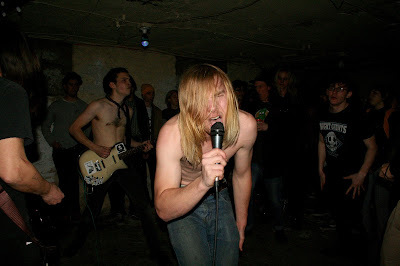 When his band wasn't kicking out their madness-inducing college town fastcore, he was stomping around the basement, shouting dead baby jokes. The band also handed a guitar to the father of one of its members and played its final few songs with him. Killakee Kat closed out the night and made sure to leave zero gas in the tank and Liquid Swords played to the most intense dancefloor they've had so far. The show was opened up by local newcomers Burnt. The band's half hour set incorporated plenty of riffs and tones familiar to Kansas City punks, but assembled them in a completely unorthodox fashion, going quiet when others would go loud and vice-versa.